Don’t let the googly-eyes fool you — Marty is one smart machine. The tall, gray robot can autonomously navigate the floor of a grocery store, using cameras and sensors to identify and report hazards such as spills and debris. After a successful pilot program this fall, grocery chain Giant Food Stores is now ready to deploy a fleet of 500 Marty robots — yet another sign that robots are the future of retail. 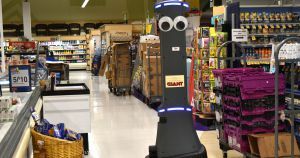 On Monday, Giant announced plans to place Marty robot assistants in all 172 of its locations throughout Pennsylvania, Maryland, Virginia, and West Virginia. The goal is to have a total of 500 robots fully deployed within six months, with the rollout taking place in waves. While Marty is programmed to looks for hazards, other retailers have deployed autonomous bots that clean floors, track inventory, and assist customers. These robots have a number of obvious benefits over their human counterparts — they’re consistent, work without pay, and never needs breaks or time off. Customers seem to like them, too, according to Patrick Maturo, manager of store optimization at Giant’s parent company, Ahold USA. Cool for customers, maybe. But retailer workers? Possibly not so much. While Giant notes in a press release that “[Marty’s] efforts free up associates to spend more time serving with customers,” given all the benefits of these bots, it’s not hard to imagine a future in which robot assistants like Marty go one step further: freeing associates of their jobs altogether.